Let’s just lay all of the cards out on the table: inboard tow boats are expensive. They can put the tow sports lifestyle out of reach for some families which makes them quite popular in the used market (Search our site!) But with the introduction of the new forward-facing Volvo-Penta stern drive traditional runabout manufacturers are able to offer reasonably priced tow sports alternatives that you can even surf behind - much like the brand new Four Winns TS222. 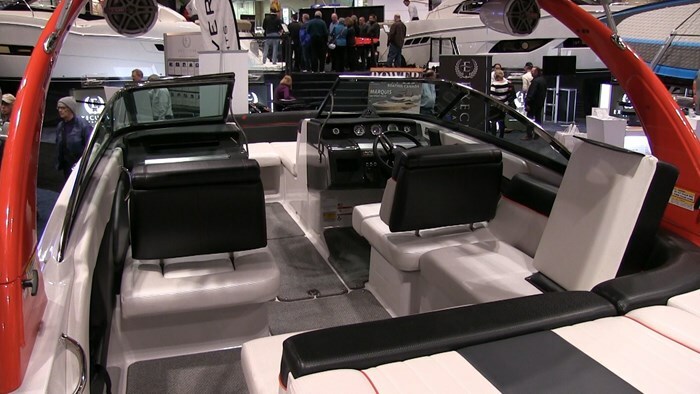 TS standing for Tow Sports and the 222 is the smaller of two brand new models, a larger 242 is part of the line-up as well, Four Winns describes these boats as a “no compromise inboard alternative” and being able to give this boat a thorough walk through at the Toronto International Boat Show that’s exactly what it is. At 22 feet 7 inches long it’s a manageable side package and Four Winns makes full use of the 8 foot 6 inch beam by carrying the width all the way forward to the bow that gives the TS222 a snub nose design - a nice change from the overpopulated pickle fork design. Walking into the boat through the port side walk through you enter into an L shaped cockpit design going up the starboard side of the boat. The helm chair is part of this and it’s actually more of a bench style seat and the backrest tilts forward converting the layout into a chaise style lounge for when the driving is done. Across from this is the co-captain pod style seat with matching tilting backrest - a smart feature since most of the action is going to be happening behind the boat. The bow is pretty traditional with two lounge seats and an available filler cushion to make a full sun lounge. There’s padded backrests if you want to face backwards into the boat and there’s room for a few, again thanks to that beam being carried forward. 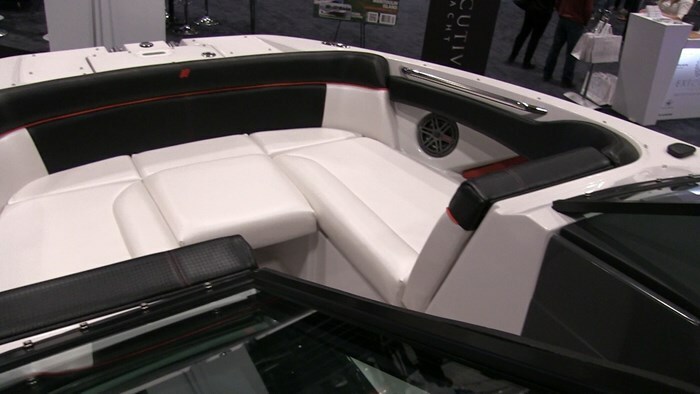 The marine grade vinyl Four Winns packaged this boat with has a unique carbon fiber style texture to it and double stitching with it to really solidify this boat as a premium tow boat. The helm on the TS222 is very simple with a clean and uncluttered layout. Above the tilt steering wheel mounted in the dash is a multi display single gauge, tachometer, trim gauge and Zero Off speed control system which is an absolute must if this is going to be a serious tow sports contender. The switches were simple aircraft style toggles and there was a small electronics compartment where you would also find the 12V plug and aux input for the stereo. 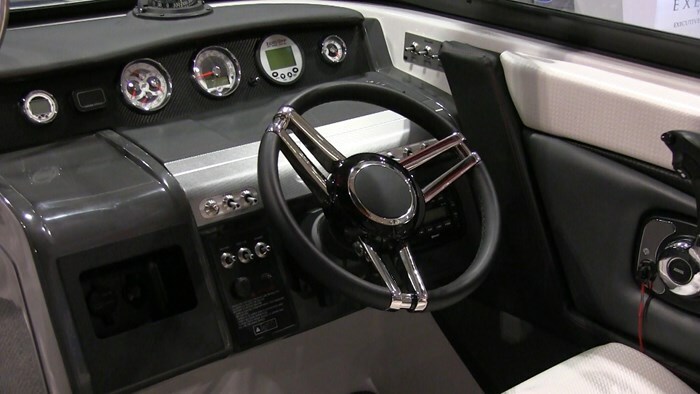 As mentioned above, this boat features Volvo-Penta’s Forward-Facing sterndrive. 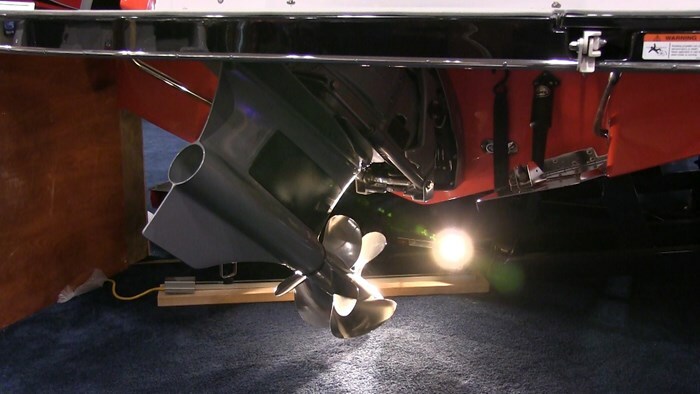 This puts the twin, counter-rotating propellers at the front of the drive and tucked safely under the hull of the boat making it more than safe for surfing. Traditional stern drives are perfect for surfing because by trimming the boat up actually creates a bigger wake by channeling that energy into the wave. Traditional inboards are fixed and their propulsion is forced down and away from the wave, relying more on ballast for size. That said there is no replacement for displacement and the TS222 has a quick fill ballast system along with surf tabs to perfectly shape your wave no matter which side your rider prefers. This all sits on Four Winns’ award winning Stable-Vee hull design that gives your precision, automobile like handling at high speed turns and an extended running surface for increased stability overall. Finally the TS222 really just looks the part as well. With two colour choices to pick from we saw the Passion Red TS with the colour matched wakeboard tower that comes standard with board racks. The biminis is a must have option however if you are going to spend some extra time out on the water. And once you get a chance to ride behind this tow sports machine, that’s exactly what you are going to want to do.